YOU SAVE $13.99 To $39.99 or More when you take advantage of this fantastic offer. 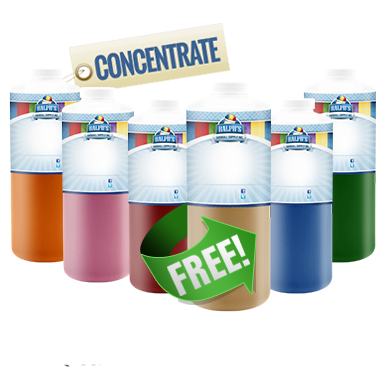 1 Gallon free with every 5 Gallons you buy. You save $15.99 or more when you take advantage of this fantastic offer. 1 quart free with every 5 quarts you buy. You Save $7.99 to $12.99 or More when you take advantage of this Snow Cone Syrup offer. 1 quart free with every 5 quarts you buy. Since 1976, we have made our New Orleans style Sno Ball Flavors with 100% pure cane sugar. Ralph’s began as a small family venture and quickly grew into an international business. 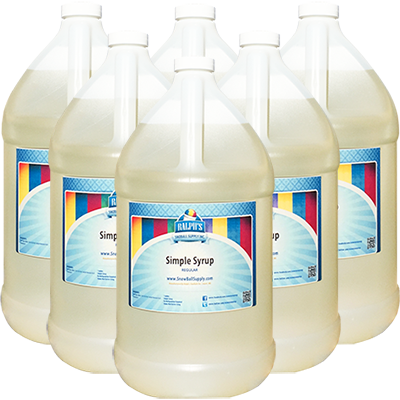 We started with a 100% cane sugar simple syrup recipe and we still use that same recipe today. It has stood the test of time. We opened our first little "Stand" with less than 10 flavors. But, as the demand for more flavors grew quickly, we began to create our own signature flavors that are still popular today. 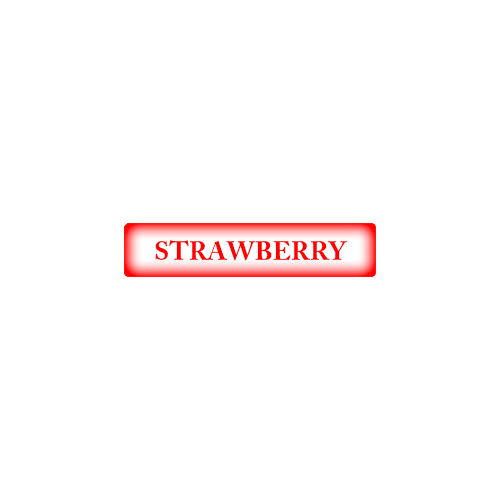 Several locations and several years after we started the business, we began providing other shaved ice businesses with the same tasty treat and great products that we were serving to our customers. 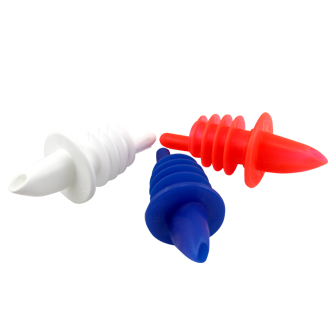 Today, our products, supplies, accessories and snow cone equipment are shipped worldwide and are available to everyone from individuals to churches, hospitals, water parks, shaved ice businesses, and more. Best of all, No minimum purchase is required and we offer great deals on our products, making it easy for you to make Ralph’s SnoBall Supply your # 1 Supplier. 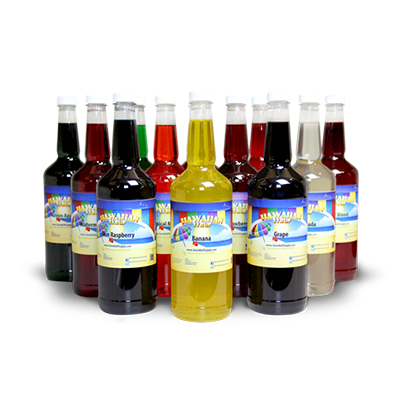 At Ralph’s SnoBall Supply, our goal is to offer products that are second to none. 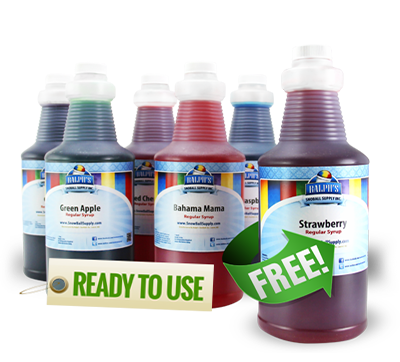 We offer Ready-To-Use Regular, Diet and Sugar-Free Snow Ball Flavors - sometimes referred to as Snow Cone Juice. 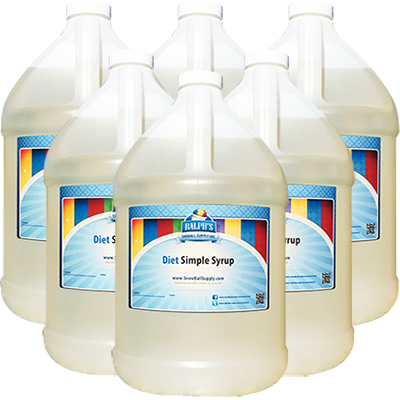 Our regular and Diet flavors are made with 100% natural cane sugar, which is the best tasting sweetener in the world. The best tasting sweetener makes the best tasting shaved ice syrup. 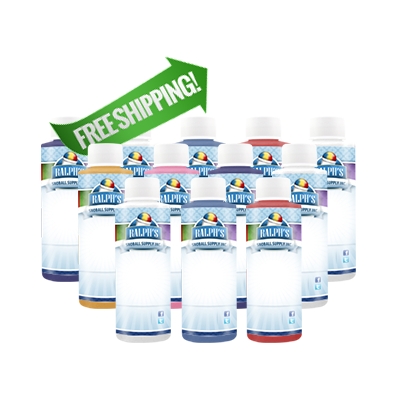 Our sugar-free flavors contain zero calories and zero carbohydrates and is made with 100% Splenda, which is made from cane sugar. Natural cane sugar not only tastes better, but it's has been proven safer than some of the cheap sugar substitutes. The chart below shows how many servings you can get from each bottle size pouring about 1½ ounce over a 6-ounce cup of shaved ice. You save money when you take advantage of this fantastic offer. 2 pints free with every 10 pints you buy. 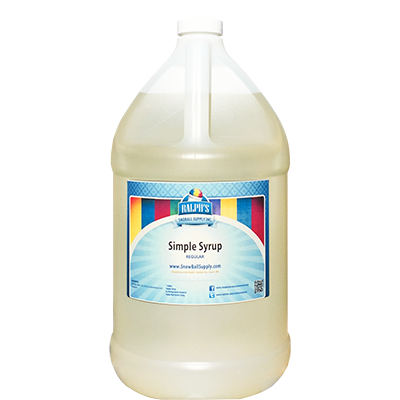 Our New Orleans Style Simple Syrup Is made with 100% natural cane sugar. Our New Orleans Style Regular Snoball Syrup Is made with 100% natural cane sugar. Ralph's Sugar Free Snow Cone Syrup is made 100% splenda which is made from cane sugar. 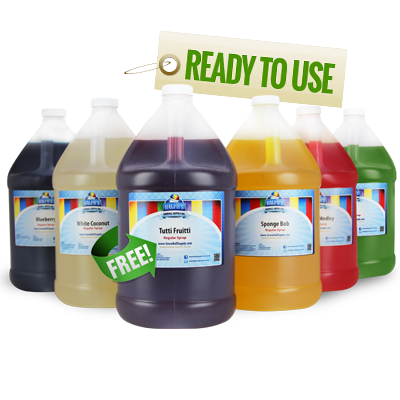 You save money when you take advantage of this Snow Cone Syrup offer. 1 quart free with every 5 quarts you buy. YOU SAVE $37.99 or More when you take advantage of this fantastic offer. 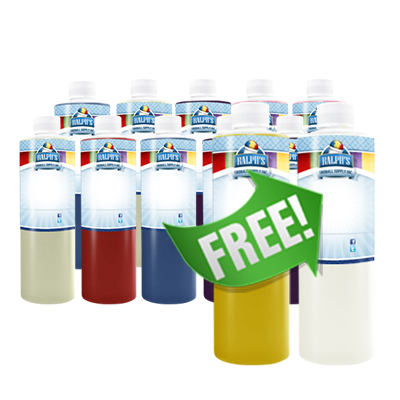 1 Gallon free with every 5 Gallons you buy. Available in blue, red, orange, yellow, green, purple, and pink. You save money when you take advantage of this Snow Cone offer. 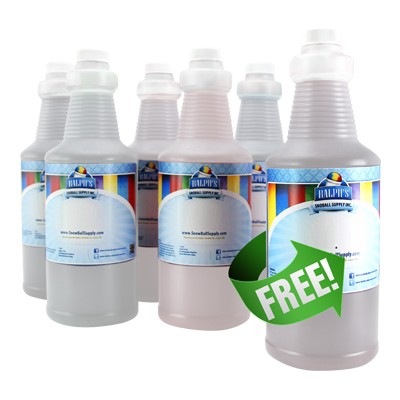 1 Gallon free with every 5 Gallons you buy. These cups are biodegradable and made from the renewable resources. Snow Cone Concentrate at Ralph's SnoBall Supply is made with the finest ingredients available. 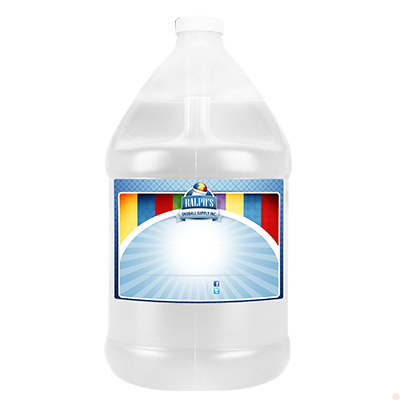 Snow Cone Bottle: Clear plastic long neck 32 ounce bottles are perfect for pouring Snow Cone Syrup over Shaved Ice. 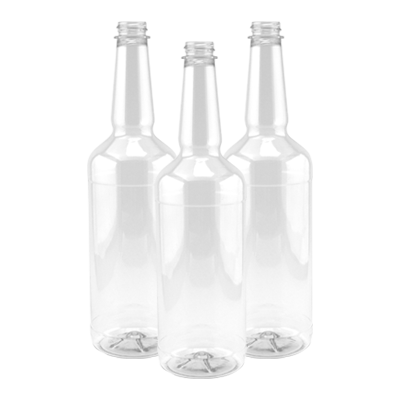 Plastic Pourers fit our pint bottles, quart bottles and clear32 ounce pour bottle and are used to dispense an even flow of snow cone syrup. 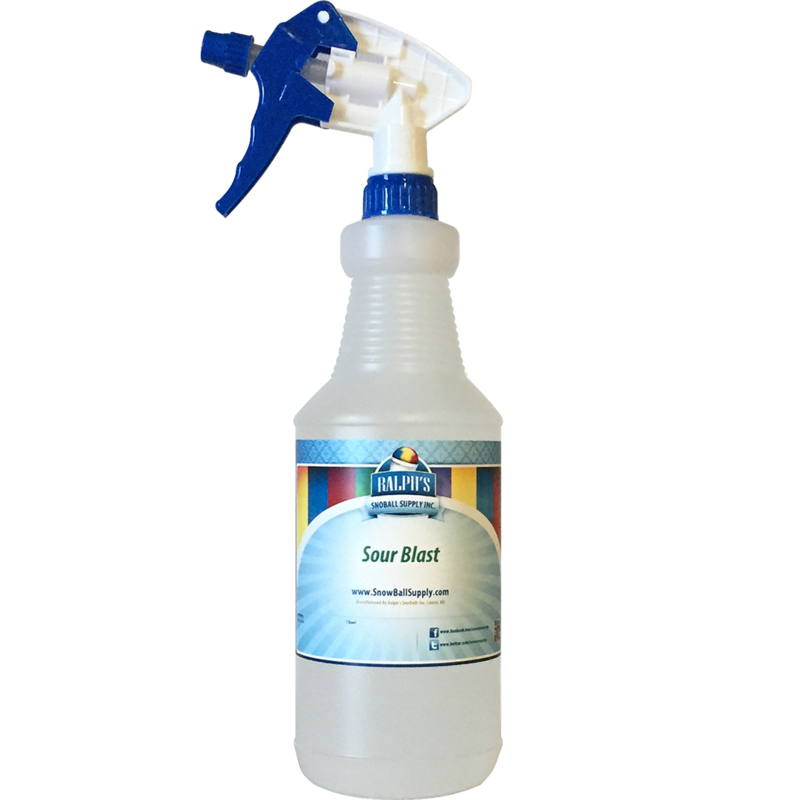 Spray the top of the snow cone with sour blast to give it a delicious sweet and sour taste that many people love and gladly pay extra to get it. Flavor Concentrates are also available if you prefer to make your own Syrup. Ralph's flavor concentrates contain the finest ingredients available. All of our concentrates are available in over 150 flavors. 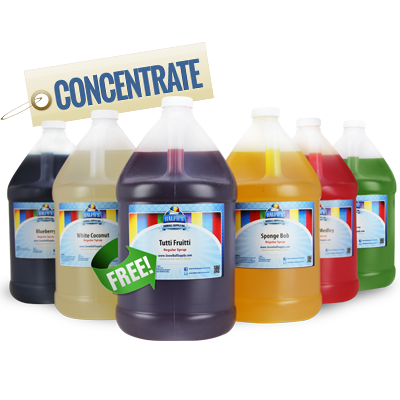 We also have a full line of supplies and accessories, as well as snow cone machines. In a nutshell, we have everything you need to start your own snow cone business. The Ralph’s guarantee: We promise high quality, fast and friendly service and big discounts on all of our products. 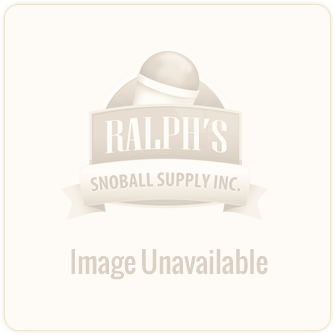 You can count on Ralph's SnoBall Supply for premium quality products and Supplies. From A Satisfied Snow Cone Syrup Customer! To whom it may concern,Just wanted to send a letter of deep appreciation for the existence of your company and your operation practices. I own a small town store in Center Point, IA that sells Unique gifts price and also contains a concession area. We are opening soon so have began the task of searching for vendors to fulfill our needs. Much to our surprise this has been a daunting task. I have searched for hours on the internet, just to find a company that could supply snoball supplies at a reasonable price and did find many with one exception, shipping! 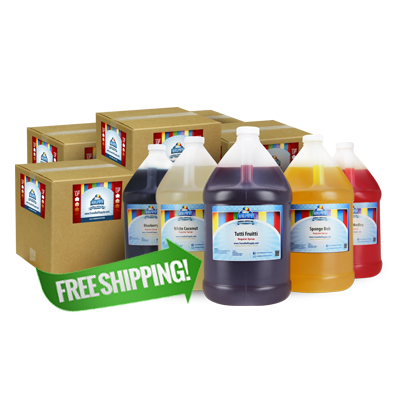 I’ve seen many with quart bottles as low as $4.88, how ever shipping cost ranged from $30.00 to well over $100.00 just for regular ground. A Shaved Ice Flower Cup is a plastic or biodegradable cup that is used to serve snow cones and other shaved ice deserts. The rim of the cup is shaped somewhat like a flower. The body is tapered and it has a flat bottom. It comes in various sizes and colors. The biodegradable flower is clear. All About Shaved Ice Flower Cups The Flower Cup is a relative new-comer to the snow cone shaved ice industry. Amazingly, Flower Cups hit the ground running, so to speak and has shown no sign of slowing down. 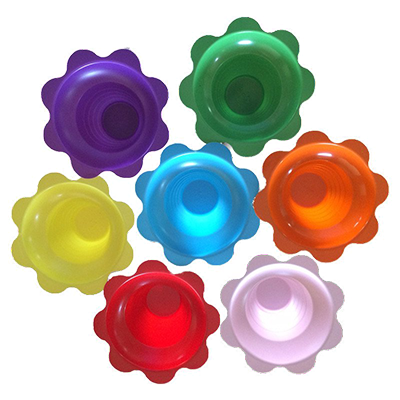 Why has the Flower Cup become so popular, so fast? Soda Mix for making carbonated drinks at home is the latest American Craze. Americans love convenience and so do most human beings. With the relatively new Soda Stream machine, anyone one can produce carbonated sodas at home at an affordable price and in almost any flavor imaginable. It would be a simple choice if all soda mix flavors were created equal but that is hardly ever the case with anything. In side-by-side tastes tests the taste of our flavors were rated superior! A snow cone is a dessert item usually made of compacted shaved ice flavored with a brightly colored sugary syrup, usually fruit-flavored. Variations include the “stuffed” snow cone, which has a layer of soft-serve vanilla ice cream inside. Some are served with a spoon, and some are meant to be eaten with the hands like an ice cream cone. Snow Cone History Samuel Bert of Dallas sold snow cones at the State Fair of Texas in 1919, and he invented a snow cone-making machine in 1920. Bert was a fixture at the State Fair, selling his snow cones there (and selling his machines world-wide) until his death in 1984. By the 1870s, the snowball’s popularity had risen to the degree that in the warm summer months, theaters would sell snowballs to keep their patrons cool. Because of this association with the theater, snowballs were thought of as an upper-class commodity. Signs in theaters instructing patrons to finish their snowballs before coming in to the second act are the earliest tangible evidence of snowballs. In the theaters in Baltimore during the time hand shavers were used to shave the ice. Around the city, snowballs were served on newspaper, but in the classy theaters, butchers’ boats were used. In the 1890s, many people started to invent easier ways for snowballs to be made. In that decade, six patents for electric ice shavers were filed.